The title of this article "shell-game" is apt for more than one reason. Not only did the sister battleships YAMASHIRO and FUSO die under a deluge of shells and torpedoes, but their identities have been continually transposed -- as in the proverbial game of shells on a table -- by historians ever since. Indeed, since both were members of BatDiv 2, both battleships shared most of their careers together, and by an interesting quirk, died on the same night within miles of each other, victims of the same enemy, during the Battle of Surigao Strait (October 24-25, 1944). Thus stated in this bare form, it is obvious that such circumstances, particularly during a night battle, could easily produce confusion. Such indeed has been the case, aggravated by the fact that FUSO seems to have had no survivors post-war and YAMASHIRO only ten. Predictably, these factors have led to confusion, even among the Japanese who were present during the action. As a result, down through the decades since World War II's end some authors have said that it was YAMASHIRO that fell to gunfire and FUSO to destroyer torpedoes, and others the opposite of this. When Samuel Eliot Morison and the U.S. Naval War College published their distinguished histories of the naval conflict, they came down decisively in favor of the view that FUSO was torpedoed first, fell out of line and blew up at approximately 0338, while flagship YAMASHIRO continued into the storm of gunfire and sank later, at 0419. This reversed a number of the contemporary accounts of the battle that had been based on the interrogation of SHIGURE's skipper. The Morison view was again affirmed in 1979 in Adrian Stewart's respected book on Leyte Gulf. Recently, however, this widely accepted interpretation of the events surrounding the battle has been inexplicably challenged and reversed yet again by the most current writers on the subject. In 1994 a new book, The Battle of Leyte Gulf, by Thomas Cutler appeared, and opted for the YAMASHIRO being hit first and left behind to explode, while FUSO faced the gunfire of the U.S. Battle Line. Although presenting no clear justification for the reversal, nor citing new IJN material, Cutler's book was the first new work on Leyte Gulf in some time, and presumably carried weight. The revision gained momentum early in 1999, when an important authority on Japanese warships repeated the transposition of the BB's fates. The Polish author Janusz Skulski published his latest contribution to his acclaimed "Anatomy of the Ship" series--a comprehensive study of the battleship FUSO. In it, Skulski is aware of and explicitly discusses the fact that two versions of the fate of the twin battleships exist, the first being the version put forth by Morison and the Naval War College. Skulski then continues by stating that there has always been a competing "Japanese" version of the tale that states essentially the reverse of the Morison version. Skulski comes down in favor of the second interpretation, asserting that it was YAMASHIRO that was the early victim, and FUSO that sank later at 0419, thus directly contradicting Morison. Skulksi states his case as follows: "The Japanese version claims that FUSO sank fifty minutes after YAMASHIRO as a result of gunfire from battleships and cruisers of RAdm Oldendorf's fleet; the second version, propagated by U.S. publications, claims that the positions of the FUSO and YAMASHIRO in the battle were reversed, FUSO sinking first. Following extensive research, it seems that the Japanese version of the events is the most accurate." Since Skulksi's new book is the most current work on the subject, and his reputation as a scholar on Japanese warships well known, the common wisdom would apparently require a revision of the accepted historical record. However, after the slender scraps of evidence on the battle are combed for any and all clues, it appears that Skulski's claim simply cannot be maintained. Although of late it has become fashionable to challenge S.E. Morison's accuracy on specific points of detail, in this case the proposed revision appears unsound. Unless decisive new evidence to the contrary appears, it seems nearly certain that the Morison, or the so-called "U.S. version" is nonetheless the correct one, and has always been so. Its assertions originate from a truly exhaustive analysis of the Battle of Surigao Strait by the War College, and are therefore not to be lightly disputed. The War College used IJN reports, radar tracks, survivor's testimonies, PT boat sightings, and everything else imaginable to reach its conclusions. Hence, the "U.S. version" has tremendous weight of evidence behind it. More importantly perhaps, there is also no monolithic "Japanese version" that states that the U.S. view is wrong, as will be seen. To indicate such is to misstate the Japanese sources. It is true that Masanori Ito's The End of the Imperial Japanese Navy among others concludes that YAMASHIRO was hit and blew up, and FUSO sank after, from gunfire and torpedoes. On the other hand, the Japan Defense Agency official history (BKS) and others opt for the Naval War College's version of YAMASHIRO going down under gunfire. The essential point here is that the Japanese sources -- like the English ones -- contradict each other, and this is usually tied to the date of publication or source(s) used. This last fact becomes important when the sources are considered. (A full consideration of the sources and their chronology, is discussed in a separate dedicated page here.). In the article that follows I hope to demonstrate not only why this is so, but to shed new light on the fates of both battleships. In so doing, I will be presenting details perhaps never before published. These details not only help clear up the confusion, but also make it possible to glimpse something of the moving and dramatic story of the last stand of these two Japanese battlewagons. It is these details that actually make it a story worth retelling. Prior to their simultaneous demise in the violent Philippines battles, the careers of the YAMASHIRO and FUSO had been largely uneventful. Due to their slow speed and advanced age, both battleships were largely relegated to training duties with Battleship Division 2 in the Inland Sea. As such, little disturbance came their way. The most dramatic moments for both sisters came in 1943 in separate incidents. FUSO was present on the fateful afternoon of 8 June, 1943, when MUTSU blew up and sank at Hashirajima anchorage. It was FUSO's boats that were instrumental in rescuing most of the 200-odd survivors of the disaster. For YAMASHIRO the moment came on 5 November of the same year while returning to Kure from Truk, when the carrier JUNYO (which YAMASHIRO was accompanying) was torpedoed in Bungo Strait and YAMASHIRO was also hit by a dud torpedo. But that was about the closest either of the elderly ladies came to the heat of combat. Then came the fall of 1944 and the epic Battle of Leyte Gulf. The complex Combined Fleet plan for the thrust to Leyte (Operation "Sho-Go")is generally well known, and its details need not detain us here. (For more an overview see Leyte Naval Battles). Suffice to say the First Diversion Attack Force of Admiral Kurita -- comprising such leviathans as the superbattleships YAMATO and MUSASHI -- was to force the San Bernardino Strait, the northern entrance to Leyte Gulf. At the same time, a smaller force under Vice Admiral Nishimura Shoji was to penetrate the southern entrance, the Surigao Strait. It was to this force that BatDiv 2 belonged, with YAMASHIRO flying Nishimura's flag, who was the senior admiral present. (Such was the IJN's "surplus" of flag officers by this date that both battleships were captained by Rear Admirals; Shinoda Katsukiyo in YAMASHIRO, Ban Masami on FUSO). Finally, in hopes of diverting the lethal power of the U.S. Navy's carrier fleet from these two thrusts, Admiral Ozawa was to come down from Japan with a force of empty, but enticing, aircraft carriers serving as bait. Nishimura's Third Section departed Brunei at 1510 on 22 October, setting course eastward and slipping through the American submarine cordon undetected. The American subs had pulled north to intercept Kurita's force, and a gap had thus opened in Balabac Strait. This fortunate beginning was followed by a second stroke of luck: though Nishimura's force was attacked by aircraft from USS FRANKLIN at 0918 24 October, it was the only air assault he suffered, as contrasted with the deluge that hit Kurita's First Striking Force the same day. As it was, this single air attack did only medium damage. Though flagship YAMASHIRO was narrowly missed several times, she escaped injury. One bomb did hit the quarterdeck of battleship FUSO, penetrating to the deck below and exploding in the wardroom. The blast started a fire in the aviation gasoline tanks near the catapult that destroyed all her float planes. FUSO swung out of line momentarily, out of the wind, but the fire looked worse than it was, and Ban Masami had it extinguished within forty-five minutes. Other than the loss of her planes, the bomb was no impediment to FUSO's battle worthiness and she maintained her speed. The final air damage to the force was to destroyer SHIGURE, that lost the gun crew of No.1 gun killed by a bomb hit, but the turret remained operable. After a deceptively uneventful passage the rest of the afternoon, Nishimura's force entered Surigao Strait late on the evening of October 24. In fact, since the air raid in the morning, Third Section had not even been so much as strafed or disturbed in any way. This uncontested advance was indeed deceiving, for in fact Nishimura Shoji and Third Section were steaming straight into the jaws of a trap of the first magnitude. Their American opponent, Admiral Jesse B. Oldendorf, had deployed his overwhelming forces to gain the maximum advantage. Barring Surigao Strait was an incredible layer of PT boats, destroyers, and finally, the great guns of cruisers and no less than six battleships. The Japanese were headed for a tremendous concentration of torpedoes and gunfire that were indeed "out of a War College text book" scenario. In retrospect, the Japanese had little to no chance of success. Nor was Admiral Nishimura ignorant of the odds facing him. At 1235 a MOGAMI scout plane had provided a numbingly accurate report of what Third Section was up against. Despite this, Nishimura pressed onward. He knew that success of the battle depended on the First Striking Force of his senior Kurita getting though San Bernardino Strait. Anything that assisted this was justified, and he drove on with his attempt to break-through to Leyte Gulf. The resulting clash was the Battle of Surigao Strait. The Battle of Surigao Strait was effectively joined at 0200 on the 25th. In the ensuing night engagement and the pursuit that followed, the battleships YAMASHIRO and FUSO, heavy cruiser MOGAMI, and three of the four destroyers escorting them would all be sunk. In their sinkings, all but the cruiser would take down their records and most of their crews. As a result, detailed Japanese records of the battle are perilously close to non-existent. What can be learned has to be tediously reconstructed from the few action reports, testimony of survivors, and signals between ships. Consequently in the study that follows it will be necessary to risk the impatience of the reader with often stark quotes and times from radio-telephone logs. After successfully repelling repeated waves of triple PT-boat attacks, the Third Section was still unscathed and just before 0300 commenced to alter formation into line ahead preparatory to breaking through to Leyte Gulf. It was at this moment that havoc struck in the form of U.S. Navy destroyer torpedo attacks. Even as the destroyers (see Surigao link above for details) were commencing their approach, the last of the PT trios was boldly boring in to attack battleship FUSO. At 0250 PTs 495, 489, and 492 were rapidly closing to attack the second large ship in column, that is, the battleship FUSO. They did not yet have visual contact with the target, but the radar pip was large, and clearly a capital ship. However, before they could do so, Coward's destroyers attacked and the situation changed. Nonetheless, this reprieve from attack did not spare the FUSO from injury. Steaming down strait as the last of the PT attacks faded away, were the five destroyers of Captain Jesse G. Coward's DesRon 54. Coward himself led a division of three on the east side of the strait while his last two ships were coming down on the west. Hence, Nishimura's column was to be faced by destroyer torpedo attacks from both sides nearly simultaneously. Coward's division started launching torpedoes at 0259 aiming a spread at the starboard flank of Nishimura's column. Ten minutes later the west flank destroyers fired their own spread of torpedoes. When the American DDs launched torpedoes, Nishimura's ships had assumed line-ahead column. ComDesDiv 4 in MICHISHIO led, with ASAGUMO, YAMAGUMO, and SHIGURE following. Flag battleship YAMASHIRO followed behind the destroyers, with battleship FUSO and cruiser MOGAMI following at 1 kilometer intervals astern. The "fish" from Coward's division intersected the Japanese line at 0309-0310. The MOGAMI, steaming in formation behind FUSO, describes what happened next: "...evaded torpedoes. Direct torpedo hit [observed] on starboard side of FUSO amidships, causing ship to list to starboard and lose speed. FUSO fell back, and MOGAMI moved on behind YAMASHIRO. Thereafter several torpedo attacks received, interspersed with intermittent and accurate enemy shellfire." This is how the MOGAMI saw it. Only two other participants produce survivors in a position to relay accurate details regarding the initial hits against FUSO: the YAMASHIRO and SHIGURE. However, no one on YAMASHIRO initially seems to have noticed when FUSO separated from the formation, and was lost to view. The reason seems to be the same thing that held SHIGURE's attention: the 0320 torpedoing of three destroyers in front of YAMASHIRO. SHIGURE does not even notice hits on any BB at 0310, let alone identify which was which. [It must be remembered that SHIGURE was far ahead and in poor position to observe this however]. Thus, we are left only with MOGAMI's well-positioned but lone testimony at this point. However, from the American side comes evidence that what MOGAMI observed was actually two torpedo hits on FUSO, not one. The USS MELVIN reports that at 0301:20 she commenced firing nine torpedoes at the second BB in column [FUSO] at a range of 11,800 yards, with FUSO tracked as making 17 knots on a due north course. Eight minutes later, at "O309: Approximate time that our torpedoes crossed enemy track, two large and separate explosions seen." One minute after, the Japanese force was seen to turn to course 15 degrees True, in apparent evasion. It is noteworthy that the important eyewitness observation from MOGAMI directly astern of FUSO also constitutes the only details we have for location of that ship's damage. At least one torpedo, and more likely two, had hit amidships. The damage might have been greater, but MELVIN had underestimated FUSO's twenty knot speed, and most of her spread had missed. As for the hit or hits, a likely outcome of strikes amidships would have been flooded boiler and/or machinery spaces, as well as the possibility of starting a fire near the amidships magazines. The blows likely killed communications, and possibly knocked out all the starboard machinery, thereby cutting the battleship's speed drastically. Ban Masami swung his vessel out of line, probably to clear the formation to prevent a collision as a result of his sudden loss of speed. As has been seen, the MOGAMI's record does not say what the subsequent movements of the FUSO were, as that stricken battleship was rapidly left astern by the surviving BB and the cruiser during their northward advance. However, the U.S. Navy's observations and radar tracks fill in some of the gaps. Recall that three PT-boats were closing to torpedo FUSO when the destroyer attack came. At 0311 these PTs sighted their target visually, and identified it as a BB. However, it had slowed to about 12 knots (USS MELVIN's torpedoes had hit just prior), though still going north. The PTs moved in closer to a shadowing position. U.S. radars tracked the battleship as losing speed and by 0320 making a wide turn to starboard, a virtual 180 degree reversal of course. At this point, the ship proceeded some distance south, as if in retreat. Apparently the FUSO retained some propulsive power with her port machinery spaces. But the damage inflicted was soon to trigger a catastrophe. For the YAMASHIRO's last hours we fortunately have a bit more data. These include the Action Report of the MOGAMI, the action report of the SHIGURE (when allowance is made for her mis-identification of FUSO), the U.S. Navy's own radar tracks, and finally and most important, the actual eyewitness testimony of a surviving officer, the chief of the Accounting section, Lt. Izaki Sato. Izaki was on or near the bridge during the climatic part of the battle, and thus provides not only important details of the damage received by YAMASHIRO, but also a precious glimpse on the last moments of the flagship's skipper and Admiral Nishimura. Since in general YAMASHIRO's survivors could only approximate the time events occurred during the battle, reference will be made to the evidence of U.S. radars and reports at appropriate intervals. After FUSO fell out of formation at 0310, further disaster struck ten minutes later. The torpedoes from Coward's western division now arrived, and in quick succession three destroyers and the YAMASHIRO were all torpedoed from port at 0320. The YAMAGUMO blew up and sank with all hands, ComDesDiv 4's MICHISHIO was crippled, and the ASAGUMO had her bow blown off. Afterward, the YAMASHIRO, MOGAMI, SHIGURE, and initially ASAGUMO as well, continued north toward Leyte Gulf. Left behind was crippled FUSO, the drifting MICHISHIO, and the patch of debris that was all that was left of the YAMAGUMO. Lt. Ezaki reported that the torpedo hit at 0321 from MONSSEN had struck YAMASHIRO's port quarter -- "left hand side toward rear" -- and apparently caused a fire, for it "created a danger of an induced ammunition explosion". As a result, YAMASHIRO's commanding officer RAdm. Shinoda Katsukiyo ordered the flooding of the No. 5 and No. 6 magazines as a precaution. Though speed temporarily fell to ten knots as a result, the damage was "no impediment" to battle integrity, and by 0328 the flagship was making 18 knots again. At 0330 precisely, Nishimura sent an urgent battle update to Kurita, and described the situation as he knew it at the time: "BatDiv 2 SMS 250330: Enemy destroyers and torpedo boats disposed on both sides of north entrance to Surigao Straits. 2 of our destroyers have received torpedo hits and are out of control; the YAMASHIRO received one torpedo hit but her battle cruising is unhampered." Second, the results of the disaster that had befallen Nishimura's destroyers at 0320 apparently happened just beyond his view, for his message fails to account for the fact that destroyer YAMAGUMO had already gone down. Only the crippled MICHISHIO and ASAGUMO remained by the time Nishimura's flagship passed through their position, hence "two destroyers" are all he saw. Presumably he felt both YAMAGUMO and SHIGURE remained as screen somewhere ahead. In fact, neither destroyer was in position. YAMAGUMO had blown up sunk, and at this moment, SHIGURE was on her way south, seemingly leaving the battle. In reality, SHIGURE's LtCdr. Nishino was attempting to determine the condition and whereabouts of the YAMASHIRO, which he assumed had been the battleship that had dropped out. Not realizing the flagship was the remaining BB, Nishino reversed course, and at 0327 passed YAMASHIRO on an opposite course, and then MOGAMI two minutes later. Nishino testified later that he was seeking to possibly transfer BatDiv 2's flag if necessary. For this purpose SHIGURE continued south for a time, but 0330 he thought better of it and reversed course again to resume the advance north. Ironically, he had approached to within 5,200 yards of the stricken FUSO, and a lookout reported sighting what appeared to be a battleship, but now offered no aid. It was not to be the last time that SHIGURE ignored a comrade! Two minutes after sending his last message to Kurita, Nishimura's flagship YAMASHIRO suffered another blow. Beginning just after 0325, another wave of American destroyers had begun attacking the Japanese formation with torpedoes and gunfire. Some of their shells started a fire in YAMASHIRO's superstructure, but they were driven off by the battleship's 5.5" secondary battery. However, at 0340 MOGAMI's record states: "Direct torpedo hit observed on YAMASHIRO (apparently near the bow)." The next entry describes how MOGAMI herself was struck by shells in the same moment, and her No.3 turret disabled. At this point then, the MOGAMI has clearly distinguished between both battleships. She had already noted FUSO sheering out of formation, and now, having caught up to YAMASHIRO, observed her being hit by a torpedo thirty minutes later. Admittedly, her identity could have been mistaken, but given MOGAMI's position astern of FUSO, this seems unlikely. Since MOGAMI's times are approximate, the War College instead times KILLEN's hit on YAMASHIRO as coming at 0331:18, based on KILLEN's report. Nonetheless, the Japanese time may be more accurate. In any case, this passage deomstrates that the YAMASHIRO is explicitly identified in the Japanese record at a point in time when Skulksi's version of the story would have us believe she supposedly was already knocked out! The second torpedo hit had been fired at 0324 from the USS KILLEN. It slammed into YAMASHIRO's port side near the bow (according to MOGAMI above), but Izaki placed it more amidships on the port side. In the event, immediately "communications became bad", and it was difficult to communicate with anything other than radiophone. This hit also seems to have had greater effect than the first hit, for Nishimura's flagship began to slow down rapidly, and at one time was moving at only five knots. It appears that MOGAMI and SHIGURE may have paused in their advance as well, for Nishimura subsequently came on the radiophone with irritation: "We have received a torpedo attack. You are to proceed and attack all ships!" In other words, they were not wait for YAMASHIRO or attempt to stand by her, but were to get on with the battle. One can imagine MOGAMI Captain Tooma Ryo's feelings at being told to plunge ahead toward the American battle line without the support of the YAMASHIRO, almost by himself. He did so, but these concerns proved premature for all. With singular tenacity and skill, YAMASHIRO's heroic damage control team got the situation back in hand; within five minutes of the second hit Nishimura triumphantly built up speed again to 18 knots. YAMASHIRO thereafter resumed the advance and attack as well. As Izaki put it, "his ship had already received two torpedo hits by 0340, but was still able to make speed for battle." At 0345 more American destroyers attacked, engaging the crippled destroyers MICHISHIO and ASAGUMO. Nishimura turned YAMASHIRO forty degrees to starboard and opened fire with his secondary battery. This soon drove off the enemy, but a deluge of shells was about to descend on the brash Japanese battleship and MOGAMI. Before this however, further catastrophe now befell Nishimura's reduced command. At a quarter to four, the northward advancing Second Striking Force of Admiral Shima (aboard heavy cruiser NACHI] was some forty miles astern of Nishimura's force. At about 0345, Shima's ships as well as the American destroyers both observed a huge blossom of light and fireball as an unidentified capital ship blew up without warning. In fact, nine miles astern of Nishimura, the battleship damaged by torpedo attack at 0310 had exploded! The three PTs -- 495, 489, and 492 -- were surprised but gratified to see the BB they were following southward suddenly "burst into flames, burning furiously". This was most likely FUSO, though to repeat, Skulski and some other accounts prefer YAMASHIRO. Acknowledging and leaving that question open for a moment, it is appropriate here to ask another: What had gone wrong? After all, a sudden explosion of a capital ship was a fairly uncommon event, and FUSO's was certainly cataclysmic: the battleship was literally blown in half! This event is discussed in more detail below. Even more surprising, both halves remained afloat, albeit burning furiously. This is indeed extraordinary, and it is surprising that it hasn't been remarked upon before. The FUSO's fate is encrusted with mystery, and we will return to examine it at length later, but for clarity will first follow her sister-ship and her comrades as they pressed on to their fates. (Above) Detail of a painting by John Hamilton in War at Sea, showing YAMASHIRO and SHIGURE engaging Battle Line at the height of the battle. The time is approximately 0357, just before MOGAMI turns and after YAMASHIRO has been hit hard amidships. At just after 0350, enemy heavy gunfire finally opened on YAMASHIRO (It was actually 0351 for Oldendorf's cruisers, the BBs opening up two minutes later at 0353). According to Izaki Sato, the shooting was good, with the enemy scoring hits on the first salvos around the pagoda that started a fire near the bridge. YAMASHIRO returned fire with No.1 and No.2 main turrets, and the battle was on. During this time, situation of friendly units was uncertain, but this did not matter. However, the SHIGURE was by now thoroughly confused, having taken the YAMASHIRO for the FUSO and vice-versa. Her skipper Nishino Shigeru continued to vainly hail the "FUSO", with no reply. However, to the War College it seems likely that YAMASHIRO heard SHIGURE's chatter and took it as a reassurance that FUSO and SHIGURE were following at a distance behind. It was also around this time - at 0352 - that two things happened that are almost certainly connected. The YAMASHIRO slowed suddenly to 12 knots, and veered a bit to the east, as if delaying battle. Second, Nishimura sent a direct message to FUSO that is recorded in destroyer SHIGURE's signal log: "Notify your maximum speed!" By 0350, then, Nishimura had finally become aware with dismay that his other battleship had apparently dropped out of formation, and was asking her to report her status and how soon she could rejoin him. As noted above, SHIGURE was sending a series of hails to "FUSO", and since Nishimura did not realize Nishino had transposed the battleships, it seems likely that Nishimura took this as evidence that FUSO was somewhere astern trying to rejoin. The character and timing of this message is vitally important to the tale as a whole. First, MOGAMI's log entry makes it clear that this message was sent by Nishimura himself. Obviously, had Nishimura's flagship YAMASHIRO been the ship exploding at 0338-0345, he would have been in no condition to send a message to FUSO at 0352. Furthermore, the character of the message itself implies that Nishimura's ship was in the lead. It is easy to imagine Nishimura, confronted by a powerful enemy to his front, slowing briefly and radioing to his other capital ship to advise him as to when a rendezvous was practicable, in order that they might coordinate their assault on the American battle line. The possibility that SHIGURE's hails to FUSO were heard and taken as proof FUSO was still navigable also fits this. Taken together, these two facets of the message argue strongly that it was a beleaguered YAMASHIRO who found herself alone in the fore that night, and not FUSO. Alas for Nishimura, if he indeed had slowed to wait for FUSO or even Shima (who had signaled at 0345), neither would arrive in time. Despairing of a response from FUSO, the YAMASHIRO again increased speed to 15 knots back into the storm of gunfire. By all indications, she was particularly hard hit from 0355 to 0400. Warrant officer Izaki reported that YAMASHIRO's forward turrets pressed the attack, but unfortunately it did not seem that they were hitting the enemy. After a few unimportant hits, the YAMASHIRO's No.4 turret was blasted (probably at 0355), and a large fire broke out amidships. Thus illuminated, thereafter the brave battleship "suffered many direct shell hits" and "fire raged from aft of No.3 turret to the mainmast". The ship however, continued to make headway, despite the raging fire, and few shells had injured her machinery and hull. Much has been made of the fact that Nishimura's "T" had been crossed, thus limiting the Japanese to firing ahead. But given the circumstances, this doesn't seem to matter that much in retrospect. After all, all of MOGAMI's turrets were forward, and by 0355 battleship YAMASHIRO had lost the use of No.4 turret, and also of Nos. 5 and 6, whose magazines were flooded. That left only No. 3 amidships "masked" by the superstructure forward, which made little difference. YAMASHIRO had plenty to gain and little to lose by engaging ahead. In doing so she maintained a narrow head-on profile for the enemy's fire, making her harder to hit, while losing only a third of her available gun power. Some further details can be gleaned from the point of view of other ships. On the Japanese side, the SHIGURE reported "0350 FUSO [in actuality this was almost certainly YAMASHIRO] under shellfire", and a few minutes later "0355: FUSO [again misidentified] hit and unnavigable". But the YAMASHIRO was not "unnavigable" but rather, at 0356 had swung west, probably to unmask No. 3 turret and bring her secondary battery to bear on destroyers closing from the north. SHIGURE herself came under the heaviest fire from 0358-0403, making maximum battle speed in her attempt to evade destruction. Moments later, Cdr. Nishino had had enough, logging: "0410 Sight MOGAMI being hit, decide to retire." As SHIGURE reversed course, a shell ripped through her starboard quarter, hastening her flight. For their part, the American ships reported that just before 0400 the target BB swung westward, possibly out of control, but most thought the maneuver looked intended to unmask her other guns. This is almost certainly the case, for Izaki's testimony does not imply a loss of ship's control at any time. The YAMASHIRO steadied on a new course of 260 degrees at 0401, returning fire with every gun she could fire. She was hitting too, scoring several 5.5 inch hits on destroyer ALBERT W. GRANT and near-missing others. Though by now YAMASHIRO was burning so brightly that her secondary gun mounts "stood silhouetted by the flames", she was still making 12 knots. But at 0405 she slowed down suddenly for about three minutes, and the War College was inclined to credit this to a torpedo hit on her starboard side from a torpedo fired at 0359 by USS BENNION. A minute later, the YAMASHIRO straddled USS DENVER, but the slowing battleship was clearly in distress, and the shells falling around increasing. Suddenly, against all odds, a reprieve came. At 0409 Oldendorf got word he was hitting his own ships (the destroyer ALBERT W. GRANT), so gave the order to cease fire. Obviously this was SHIGURE's cue to retire as stated above, and apparently the YAMASHIRO also saw it as an opportunity to regroup. The sudden cease-fire must have, as S.E. Morison wrote, "been seen as God's gift to them and the Emperor". YAMASHIRO turned sharply to port, began to follow MOGAMI south, and defiantly increased speed to 16 knots! One can only marvel at where she got this second-wind from, and indeed her senior survivor opined she might have made good her retirement if not for the torpedoes that struck now. Had YAMASHIRO pulled out of radar range, she might yet have met Admiral Shima coming up the strait at high speed and now only ten minutes away. But it was not to be. According to Izaki, an attempt was made to reform with other ships, but while thus engaged, and "facing to the southwest" the YAMASHIRO received a third torpedo hit which struck the starboard engine room. Moments later a fourth torpedo hit the same side aft of the first. Immediately the engines and machinery stopped and YAMASHIRO slowed to a halt. After the fourth torpedo, she began to list "quietly yet steeply", but Admiral Nishimura (who may have been injured) merely stood fast and made no attempt to leave. (It should be noted that the direction of the list is not stated, and despite the side struck, the port list may have increased; hence the NavTech summary which gives a port capsize.). YAMASHIRO continued to "tilt silently" and when the list reached 45 degrees Shinoda reluctantly gave the order for all hands to Abandon Ship. The men obeyed, but it was far too late for most. Two minutes after the order was given (at 0419 by U.S. reports) the battleship abruptly capsized, and floated only momentarily before sinking by the stern "with deadly suddenness". With her went down Admirals Nishimura and Shinoda, and most of her 1,400 man crew. Among the survivors was Lt. Izaki Sato, who had managed to escape the bridge before the end. With him were "at first, many survivors drifting. But later U.S. destroyers came and destroyed most of them, others sought to swim to nearby shore and islands." In the end, only Izaki Sato and one other officer and eight petty officers and men survived the sinking of their gallant battleship. They returned to Japan in December 1945. On the battleship USS TENNESSEE, radar operators laconically noted that the target BB's pip had shrunk and then simply "vanished" from the radar screen at 0420. Since it was still well within range the Americans rightly concluded that the target had gone down. The sinking position was 10-22'2 N, 125-21'3 E. Subsequently, at 0557 the destroyer USS CLAXTON rescued Captain Izaki and a few others at position 10-20'N, 125-23'E, roughly due west of Eschonchada Point. This is perfectly consistent with the southeasterly current and the time lapse. The closeness of this position to the sinking position is crucial and helps clinch the identify of the north BB sunk as YAMASHIRO. When the flagship YAMASHIRO went down, only the cruiser MOGAMI and destroyers ASAGUMO and SHIGURE remained operable of Nishimura's force. Every other ship had sunk with the exception of the FUSO's wreckage, still afloat and burning. Regarding ASAGUMO, it is often overlooked that except for her smashed bow she remained underway at 9 knots and in fair shape. It is therefore correct to speak of three cripples, not two (as some accounts suggest), from Force C withdrawing south as Shima arrived with his forces. While Nishimura and MOGAMI were slugging it out with the American battle line, the 2nd Diversion Attack Force (2-YB) of Admiral Shima Kiyohide was even then advancing rapidly up Surigao Strait in Third Section's wake. At 0418, as NACHI and ASHIGARA glided swiftly past the blazing wrecks of the shattered FUSO, Admiral Shima radioed loud encouragement to Nishimura's fleet: "We have arrived at Battle Site". Alas, too late! Even as the message was sent, the YAMASHIRO was turning onto her side, the SHIGURE was streaking south, and the MOGAMI was staggering in her wake, wrapped in flames and almost out of control. In fact, it was the blazing MOGAMI that Shima sighted next, and took her to be dead in the water. Just then, at 0420, flagship Nachi's radar located targets ahead, almost certainly enemy. Immediately Shima gave the order for his cruiser division to swing right to launch torpedoes, while the destroyers with SHIRANUHI in the lead charged north. At 0423 the NACHI and ASHIGARA commenced firing torpedoes -- four from each, from their port tubes -- while steering to cross ahead of MOGAMI and out of her glare. Unfortunately Shima's staff had miscalculated: the MOGAMI was not dead in the water, but still making some 8 knots, albeit barely under control. The result was jarring. At 0430 the NACHI slammed her port bow against the MOGAMI's starboard bow abreast No.1 turret. (For full details, see The NACHI ~ MOGAMI Collision: A Study in the Fragility of History). After this embarrassing "rendezvous" between Third Section and 2-YB, Shima took NACHI and ASHIGARA in a wide loop south to assess the situation, and MOGAMI gamely fell in behind them. After one aborted try to again advance, at 0506 Shima quit the field for good, retiring with MOGAMI and destroyers ASAGUMO and SHIGURE more or less in company. It is not the intention of this article to chronicle the full Battle of Surigao Strait, and suffice it to say Shima's 2-YB made good their escape along with the ever-lucky SHIGURE, but poor ASAGUMO and MOGAMI fell victim to the American pursuit, going down at 0721 and 1307 respectively. Before her final calamity, the MOGAMI sighted the wreckage of the FUSO one last time at 0510. With this it is time to consider the fate of Nishimura's second battleship. (Above) Original photomorph art by Terrence Manton showing the crippled FUSO as she might have looked at 0345 just before exploding. The FUSO is listing and traveling at slow speed, fires spreading ominously as scattered enemy shots harry her on her southward retirement. As we have seen above, at 0309 the FUSO was torpedoed by the U.S. destroyer MELVIN. She immediately listed to starboard and lost speed, falling out of the formation, to mysteriously explode a half hour later. But that is only part of the story, and there is considerable uncertainty about even these details. Indeed, after the war the Naval War College conducted an exhaustive survey and analysis of the movements and fates of the Japanese targets at Surigao, including the FUSO. In the final report, with the absence of survivors, it despairingly noted: "No direct information of any consequence is available concerning the FUSO." Nonetheless, the information the War College analysis does contain is of great interest. What this evidence reveals is extremely slender, but precious clues and hints of FUSO's last hours that go far beyond what has been published to date. Using these, an attempt will now be made to reconstruct FUSO's fate. Two minutes after being torpedoed amidships, the battleship FUSO's speed had fallen to twelve knots. Apparently at this time Ban Masami made the decision to swing out of line, turning to course 30 degrees True, as MOGAMI passed the slowing battleship to port at 0313. Interestingly enough, with typical Japanese stubbornness, the FUSO initially continued to advance with the rest of the fleet from a position on Nishimura's starboard quarter. But at 0318 FUSO commenced turning to a due east course, still making close to ten knots. It seems likely that at this time Ban was receiving a discouraging report from his damage control officer. The torpedo damage appears to have started a fire, and apparently flooding was gaining. Possibly the starboard list was increasing. It is impossible to know for sure, but whatever the situation, it was enough for Ban to make the extraordinary decision to reverse course and retire from the battle scene. At 0323 FUSO commenced a 90 degree turn at a very slow speed to the south, settling out on a slightly erratic course of 190 degrees. Unnoticed, PTs 495 and 524 shadowed her, but did not press an attack (much to the chagrin of the War College analysts later, who could not understand why a positively identified Japanese battleship had not been attacked). The failure of the PT boats to attack proved redundant. What happened next is extremely sketchy, but after leaving the Japanese line, FUSO traveled some distance to the south. Though most writings describe her as going dead in the water, it must be stressed that this is not indicated. As seen on American radar screens, she was in painful retirement down strait. Indeed, quite possibly FUSO remained navigating at a slow speed south, while her damage control teams fought hard to master the situation. It seems however, that fires were starting to set off a mounting series of induced explosions, for at 0338 the USS HUTCHINS reported three detonations -- "two faint and a loud snap" -- from the FUSO 14,000 yards distant, and disturbances continued for some minutes. Suddenly, at 0345 the FUSO blew apart with a tremendous blossom of light that seemed to fill the entire strait, and was observed as far as from the battleship USS MISSISSIPPI who saw "flames reaching above the mastheads". Probably at this moment, but certainly prior to 0350 (when two radar pips split from one), the blazing battleship broke in two as well. Since the FUSO was hit amidships and then blown in two, the natural conclusion is to assume that either "C" or "D" (or perhaps both) amidships magazines exploded. This much would seem a safe assumption, if for no other reason than it would likely require a magazine explosion to physically sever the vessel in half. "It is our conclusion that it is well nigh impossible for the FUSO to have broken into two nearly equal parts because of her very rugged and damage resistant structure. The USS ARIZONA did not show any evidence of hull failure in the area enclosed by the armor belt, even though a massive magazine explosion had occurred. "It is however considered possible that the FUSO may have lost her bow as a result of torpedo damage. Although our war experience does not include this type of failure in battleships, several cases exist where cruisers suffered this type of damage. In the case of the USS HELENA (CL-50) the bow section remained afloat for more than twelve hours. "It is probable therefore that if other evidence indicates the presence of two floating bodies this can best be explained by the separation of the bow from the main hull of the battleship." This is fascinating theory indeed. What is odd though is explaining how both sections remained afloat after the explosion, as is asserted by numerous parties on both sides of the battle. In particular, though the stern could possibly have retained some buoyancy, it seems almost certain that the bow section, with its ungainly and top heavy superstructure, should have immediately turned turtle and sunk. However, it appears that it did not. By "appears" it is notable that subsequent observations by both Japanese and American ships reported two burning wrecks. When the historian recalls the rapid sinking of the jackknifed hull of HMS HOOD, this fact becomes all the more astonishing. When HOOD blew up, her stern half sank at once, and the bow ninety seconds later, but both of FUSO's sections remained afloat. Or did they? There exists another possibility. In WW I, when magazine explosions destroyed the British battlecruisers INVINCIBLE and QUEEN MARY at Jutland, both like FUSO, were blown in half. However, in INVINCIBLE's case both sections remained in view for a time, because of the shallow bottom. Given this example, and the fact that portions of Surigao Strait are fairly shallow, perhaps the possibility that the hulks had grounded should be considered? Yet this kind of speculation may be unwarranted. The conclusion of BuShip's Chief notwithstanding, it must be observed that in correspondence with several historians and naval authorities, it seems that a true "equal part" break-in-two should not, and cannot be, ruled out. BuShips was writing with the USS ARIZONA and the info available in the 1940's in mind. Much more has come to light about capital ship explosions since then. Battleships that exploded include HMS HOOD and BARHAM, IJN MUTSU and KONGO, RM ROMA, and the Russian MARAT. Particularly noteworthy in this context is both the MARAT and the ROMA. The MARAT was an old converted BB, with some affinity with the FUSO, and the ROMA is fascinating as a case of a modern BB that did break in two regardless of her "rugged structure". The familiar case of the HOOD can also be cited, but some of the others bear a closer resemblance to the behavior of the FUSO wreckage. The MARAT was sunk by Luftwaffe bomb hits that set off the forward magazines while she was in Kronstadt Harbor. A photo shows a huge hole in the bow, moments before the entire forepart and foremast lurched over and sank. Everything forward of the second funnel went down, but the afterpart of the MARAT remained partially buoyant and even its guns remained serviceable. ROMA snapped apart at the foremast also, following an explosion of "B" magazine after a guided bomb hit. The stern did not sink immediately, but the two sections were clearly photographed and separate. Finally, when the aft magazines of MUTSU blew up she broke in half at the mainmast. The forward section capsized at once and foundered; the stern upended, but remained afloat till the next day. All of these cases are clear examples where a BB suffered immediate main-hull failure and broke into two comparable if irregular pieces. Proposing the same for FUSO does not seem so unreasonable in light of this. The main mystery with FUSO is how two sections remained afloat. In any event, attention should be called to the fact that the actual break-point of the FUSO wreck is really unknown. "Blown in half" or "two burning sections" can mean a number of things. If the amidships magazines exploded, possibly FUSO first broke there; then the resulting stresses toppled the pagoda section, and she broke again at the conning tower line, leaving the stern and a buoyant fragment of the bow afloat and burning. Or perhaps, as has been suggested, one or both sections did turn turtle but remained afloat surrounded with burning oil which could have misled or confused observers. Unfortunately, at this time this question is impossible to answer. Only a dive to the wreck (the locating of which should be easily feasible with modern undersea technology) could answer the important question of the actual point of hull failure. The location of the hull-break would allow reconstruction of the source of explosion. For now, it must be assumed that the amidships or forward magazines exploded. That bare fact tells us little. For example, though the FUSO is routinely reported as being afire after being torpedoed, it is striking that the MOGAMI's report does not assert this. There is vague evidence that fire was not visible initially. The PTs shadowing FUSO reported that the battleship suddenly "burst into flames about 0345"; i.e., it was not afire before. In the examples cited above, in the case of HMS BARHAM, there was a subsequent magazine explosion following torpedo damage. Though simple examination of the film evidence of BARHAM's sinkings shows that she was sunk by torpedoes alone (she is on her side when she explodes) it of interest that the British Court of Inquiry found evidence that the torpedoes had started a fire in the 4-inch magazines that set off the aft 14-inch magazines within three minutes. This might suggest that the torpedo hits on FUSO started fires in the starboard secondary magazines that then set off the amidships magazine or cordite stores, accounting for the delay between torpedoing and disaster. However, the assumption of fire seems to derive only from the observations of U.S. vessels, or even just from a retroactive supposition stemming from the subsequent explosion. In other words, "The ship blew up, so she must have been afire." But was that what happened? MOGAMI reported no fire. Instead, is it possible that FUSO pulled out of line with severe flooding and loss of power, only to be subsequently torpedoed again at 0338 and blown up? This possibility does exist, but depends on firing angles and positions of U.S. destroyers that this author is unfortunately ignorant of at this time. Another "longshot" scenario is that FUSO, like KIRISHIMA and KONGO, did in fact capsize from flooding at about 0340 and then exploded, as they had. But if so, how did the sections remain afloat? All these questions have no answers, and doubtless try the patience of the reader. But they are offered merely to call attention to the full extent of mystery that really shrouds the neglected last moments of battleship FUSO. In short, we don't know whether fire or capsize caused the magazines to explode, or where the ship broke in half, and which section was larger, stern or bow. In any case, after 0345 the FUSO was all but finished. After all this speculation, one might be tempted to challenge even the explosion time. Indeed, the possibility of a different time was considered when preparing this article. Since Nishimura sent a message from YAMASHIRO to FUSO at 0352, he could not have done so if YAMASHIRO was the BB that exploded around 0340. This alone can potentially rest the case. Fortunately, however, we also have hard direct evidence that constrains the time range significantly and supports the veracity of both the 0338-0345 time range and the breaking-in-half phenomena asserted by the War College analysis. Shima's destroyer KASUMI, for example, reports at 0343 (as the force advanced up strait at 28 knots) "Ships on fire sighted. Sight gunfire indicating 3rd Section engaging enemy ahead." Speed was cut to 20 knots, and Shima's force advanced more cautiously. Now at 0343, of Nishimura's forces, the YAMASHIRO, MOGAMI, and SHIGURE were proceeding north, the YAMAGUMO had sunk, and the MICHISHIO was drifting, and ASAGUMO was moving slowly and still in action. If FUSO had blown up and "burst into flames" 0345 as the PTs reported, she best fits the description both in range and time of the "ships on fire" observed ahead. In truth, since PT boat times are generalized, KASUMI's time of 0343 may more precisely mark the moment of explosion. The KASUMI and Shima's other ships continue to advance, raising speed to 28 knots and at 0410 steered to the left to clear the burning hulks encountered. KASUMI's entry at 0418 states: "Prepare for simultaneous torpedo and gun action. Three ships on fire within visibility range. Enemy red tracers coming from shadow of Hibuson Island seen. Flashes of gunfire from apparently friendly units also seen." The time of this log entry is crucial. At 0418 the YAMASHIRO is starting to roll over, the SHIGURE is heading back down the Strait, and the blazing MOGAMI is also staggering south. Thus, the "three ships on fire" are almost certainly the MOGAMI, and the two-halves of the FUSO. American radar had started tracking a splitting of FUSO's pip after 0350. Moreover, the first two hulks are passed before NACHI's collision with MOGAMI at 0430. The net-result of all the available data is that FUSO had definitely exploded within an hour of being hit, probably at the accepted time of 0338-0345. Mori: "...although the rain stopped, we could not determine our position, poor visibility. Then we sighted two fires....two ships burning, very big ships.....we also saw a very dense smoke screen, we sighted on either side of these burning ships smoke screens laid by American ships." "Q: "At what range were these burning ships at the time of sighting?" Q: "You passed those burning ships and went on?........Did you know which were the two burning ships when you passed them?" Mori: "We thought it was two battleships, but when we arrived in Manila we heard that it was one battleship (YAMASHIRO) and three destroyers close together instead of two battleships..."
Several important points need to be made here. First, since at the time the two wrecks were taken to be both the YAMASHIRO and FUSO, the inference is that they were large hulks, obviously of capital ships. Mori in fact says so explicitly. This squares with the "blown in half" statement for FUSO, and is an easy error to understand under the circumstances. Second, the description of "burning, very big ships" and "knew they were Japanese" and "thought it was two battleships" has important implications for the FUSO wreck. To be identified as Japanese battleships so clearly, it strongly suggests the hulks were still upright with sufficient parts of the superstructure remaining to identify the class. There is also some hint that the sections are roughly equal in size, since both appeared large. Additionally, the fact that three burning ships on fire are seen fits with two battleship sections and then the MOGAMI. It is unlikely that ASAGUMO was burning by this point, and there are no other likely sources of flames, since YAMASHIRO has already gone down. Finally it might also be remarked that Shima's words convey something of the intensity of the fire on and around FUSO, which goes some length to explaining the lack of survivors. In addition, Mori's account also sheds light on how the Japanese became confused as to identity. He says that when NACHI arrived in Manila (On October 28), they "heard" that the burning vessels were in fact one BB, identified as the YAMASHIRO and three destroyers close together. The manner of this "hearing" is extremely crucial. For SHIGURE had in fact gone to Manila (On November 10) and Nishino discussed the battle with Shima and his staff, themselves recovering from the sinking of their own flagship NACHI five days prior. Thus, what Shima and Mori would have heard was Cmdr. Nishino's version of events, which as we know assumed (really without evidence) that FUSO was the "north BB" - the one that faced Oldendorf's gunfire. Only later when survivors of YAMASHIRO and MOGAMI returned to Japan was it possible to revise the facts from SHIGURE's version. MOGAMI's Detailed Action Report was not written up till December 1944, and YAMASHIRO's survivors did not return to Japan until exactly a year later after the war. As if all the mysteries about the explosion above are not vexing enough, the aftermath of FUSO's breaking in half also contains a puzzle. A tantalizing hint exists that by some miracle, the FUSO's stern section remained underway for some ten minutes after the explosion! American radar tracks show the stern section swinging to port, to the southeast, on a diverging line from the other half. By 0400 this section had opened the range between the pieces to 2,000 yards, after which its position remained fairly constant relative to the bow. The conclusion: "the explosion alone was not sufficient to cause the separation of about 2,000 yards, which the radar data indicates, and that, therefore, the stern must have continued under power for an appreciable time after the explosion." Could it possibly be true? Did FUSO blow apart at 0345, only for the stern section to be substantial and remain partially navigable?? Did FUSO's surviving officers than try to beach this section on the eastern shore, hence accounting for the southeast turn? If so, it is yet another example of the singular courage and tenacity by which Japanese ships continued to operate and their crews persevere after absorbing tremendous punishment. If so, this would strengthen BuShip's argument of a bow break-off from the main hull. Sadly, this haunting clue remains the only hint of this drama. Furthermore, it appears simply unlikely. Other explanations such as dragging wreckage, irregular wind and water resistance of the two sections, bow half capsized, etc, can also be invoked to account for the differing rates of drift and space between the remains. There is simply not enough evidence to advocate a scenario of the stern retaining power as vs other possibilities. Whatever the answer, the facts are that at 0348 the FUSO stern bore 293 True, distance 7,700 yards from the northern tip of Kanihaan Island, while the bow bore 291 True, distance 8,000 yards from the same location. By 0400 the sections had drawn 2,000 yards apart from each other, when the stern section had stopped its movement away. Both burning halves then drifted south at 2.5 knots with the current. 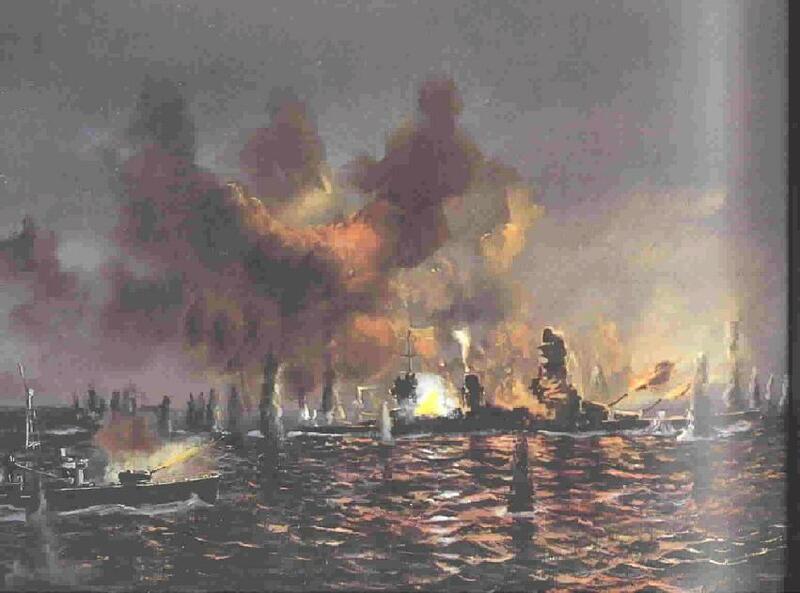 During the hour of night that followed the explosion, the FUSO's desperate survivors must have fought hard to contain or escape the raging flames. Some surely went over the side, but many who had not been killed clearly chose to take their chances by remaining aboard the hulks. There must have been a tragic flurry of hope when NACHI and ASHIGARA closed at 0410, but Shima did not stop, and the FUSO remains continued to drift south. Possibly the men were waiting for dawn, to get their bearings before attempting the long dangerous swim to the shore. This was the situation when around 0500 the destroyer ASAGUMO limped into close proximity. Given the latter's communications with MOGAMI, it seems likely that ASAGUMO also exchanged some words of encouragement with the FUSO. But it was at that time that the expected American pursuit then caught up with all of them. The American pursuit had begun at 0432 when Oldendorf himself led the left flank cruisers at a moderate speed south, after having detected NACHI, ASHIGARA, and MOGAMI in retreat at a range of 14 miles. Destroyer Division X-Ray, under command of Commander M.H. Hubbard of USS CLAXTON followed after some delay. (It was his destroyer that rescued Izaki and the other YAMASHIRO survivors). At 0518 dawn was beginning to break as Oldendorf's cruisers closed within gun range of the fleeing enemy as the Japanese passed the FUSO's wreckage. Shima was pulling safely ahead, but the lagging MOGAMI and ASAGUMO were not so fortunate. At 0529 LOUISVILLE, PORTLAND, and DENVER opened fire on all three cripples. Flagship LOUISVILLE selected the blazing battleship FUSO as target, noting the target was large, but "no course, speed zero. Very large fire burning". At 0531 at a range of 18,900 yards the USS LOUISVILLE opened fire on a section of the FUSO -- "what seems to have been the bow". A the same time her consorts opened fire on MOGAMI and ASAGUMO. The shooting was remarkably effective. Both MOGAMI and ASAGUMO were hit, and though the LOUISVILLE fired only eighteen rounds of 8-inch armor piercing into FUSO before shifting fire to MOGAMI at 0533, it proved sufficient. Whatever watertight integrity remained in FUSO's bow was destroyed by the hits scored, and the bow section went down after only six minutes. USS CONY reported it vanished off radar at 0536:30, and USS CLAXTON a slightly later time of 0540. The FUSO bow went down in position 10-09'N, 125-24'E. As if satisfied with sinking the battleship's remains, Oldendorf ordered his cruisers to break off action at 0537 and moved back up-strait to regroup, letting MOGAMI and ASAGUMO escape again. (Oldendorf, however, would reconsider and turn ships back to the pursuit in less than an hour). When sunrise occurred at 0630 the ASAGUMO was revealed as having pulled close to the burning stern of the FUSO; whether for mutual protection or to rescue survivors is not clear. It was at this time that PT 323 "sighted at 2.5 miles a destroyer standing by a large ship which was burning furiously". The DD (ASAGUMO) was stopped on a heading of about 045 True. The evidence is that at this very time the FUSO stern had commenced to sink, and if ASAGUMO was indeed taking aboard some of FUSO's men (see below) PT 323's attack aborted it. At 0646 PT 323 fired and scored a torpedo hit on ASAGUMO aft that forced the final abandonment of that destroyer. Meanwhile it was about 0640 when the blazing stern section of the FUSO at last sank hissing to the bottom. As seen, the bow had been sunk by USS LOUISVILLE's gunfire earlier at 0535. Though none saw the stern section founder, the approximate time was fixed by observation of U.S. Navy PT-boat squadrons that passed the scene at various times. The stern had still been there when PT 323 attacked at 0630, but at 0652, when the Kanihaan PTs passed the spot at a distance of only 700 yards, "though the fire was still burning furiously...there was no ship left". Evidently the FUSO's stern half had finally slipped under just moments before, in final position of 10-08'N, 125-24'6 E. In other words in a location southeast of, and exactly an hour after, the bow section's sinking. FUSO's full complement at the time of loss is unknown, but the battleship HYUGA, of comparable size and design, boasted 102 officers and 1,155 petty officers and men in October 1944. Allowing for the removal of HYUGA's aft turrets at that time (which would have reduced her crew's size), this suggests a minimum figure of 1,300 for FUSO and probably a bit more. The battleship KONGO is reported to have had about 1,600 aboard when she sank the following month as well. Finally, Maru Special flatly states a loss of 1,400 officers and men for YAMASHIRO. Given these factors, it seems as many as 1,400 up to -- but not much greater than -- 1,600 men were aboard the FUSO at Surigao. Of this number, according to the best reports, it appears that as many as three hundred had abandoned the battleship between 0540 and 0630. In the meantime, Oldendorf's ships had resumed a southward advance at 0617 and at 0707 opened fire on ASAGUMO which was stalled near where the FUSO stern had sunk. The unhappy Japanese destroyer soon went down, fighting to the last. Just after she sank, a large patch of survivors was sighted floating northeast of Kanihaan Island by USS HEYWOOD L. EDWARDS at 0722. In fact, this patch of survivors was not far distant from the final sinking position of destroyer ASAGUMO and its own patch of survivors. The EDWARDS' report clearly distinguishes between two large groups of survivors, the ASAGUMO's (which she had just helped sink) off Tungo Point, and the FUSO's off Kanihaan Island. This proximity of ASAGUMO and FUSO around 0600 has been noted above. It hints at a heretofore unremarked possibility. It is tempting to think that FUSO's survivors decided to abandon the battleship's wreckage after the bow was sunk, during the time that limping ASAGUMO was nearby, and the enemy not to be seen. Interestingly enough, U.S. vessels also got this impression that ASAGUMO was "standing by" FUSO. Though ASAGUMO's Captain and few survivors do not directly remark on this, it must be stressed that there were few survivors, and the reports of their interrogations fairly terse. In point of fact, despite the fact that ASAGUMO was in dubious shape to rescue survivors, there is slim evidence that at least a few of FUSO's men did join the destroyer's crew, as will be seen below. In any event, even if this is true, after ASAGUMO was herself sunk at 0721, both the destroyer and battleship's crew were cast into the sea at the mercy of the enemy and the elements. While it is true that U.S. Navy efforts and even interest in rescuing all but a handful of survivors for interrogation was minimal, in fairness it was chiefly the FUSO's men who chose to refuse the chance for life. As USS CLAXTON had found with the YAMASHIRO's survivors, so did USS HEYWOOD L. EDWARDS experience the same thing with FUSO's survivors. Despite cajolings, and attempts to snare some, none of the floating survivors consented to be rescued. Ultimately, unlike YAMASHIRO, none were retrieved at all. The consequence of this abstinence was tragic. Those that did not perish in the waters of the strait swam ashore, only to be butchered wholesale by Philippine natives eager for vengeance. Survivors of YAMASHIRO, ASAGUMO, and MICHISHIO all report slaughter of many Japanese in this way, and their own narrow escape from the same when a handful was handed over to American Intelligence officers. The result was that as a result of the battleships' explosion, her sinking, exposure, or murder by the natives, virtually all of FUSO's crew perished that grim day. Even so, contrary to most reports, there were survivors from FUSO, at least one. The Chief Engineer Ishii Tokichi of the ASAGUMO explicitly reported in his interrogation that a `survivor of the FUSO with them had told him that the bomb hit of Oct 24 had destroyed the wardroom and exploded a deck below'. Mentioned as an aside, this casual detail rings true and it is electrifying to think that if the interrogators had just thought to ask Ishii if the engineer had heard the rest of the FUSO's survivor's story. Inexplicably, they failed to ask. It also shows that FUSO and ASAGUMO survivors were at one time grouped together. Unfortunately, this individual's story -- if he survived captivity -- has not come to light. Nor have any others. But even if this proved true, it seems unlikely that many more of FUSO's 1,400+ officers and men survived than did the YAMASHIRO's. Finally, it might be remarked that the mingling of ASAGUMO and FUSO survivors is another piece of evidence supporting that FUSO was the battleship hulk off Kanihaan, and not the YAMASHIRO. Further, the fact that YAMASHIRO's own survivors were rescued in a position relative to the sinking position of their vessel that is consistent with the known drift factors in the Strait (i.e. a southeastward 2.5 knot current), and nearly ten nautical miles north from the site of the southern battleship's explosion, also strongly supports the case. In summation, it is this historian's opinion that the evidence clearly indicates that a reversal and retreat from Morison's accepted record is unjustified. That it was Nishimura's flagship YAMASHIRO that was the BB that engaged Battle Line and sank at 0420 is affirmed by the following factors: [A] The direct testimony of Lt. Ezaki Sato, whose description agrees closely with the times and circumstances of engagement associated with the northern battleship; [B] The USS CLAXTON's position where she rescued survivors of YAMASHIRO, which was much too far north to be from the first BB hit; [C] The MOGAMI's clear identification of the FUSO as the battleship falling out of column at 0310; [D] The evident confusion and poor observation position of the SHIGURE when FUSO was hit at 0310; [E] the messages from Nishimura to Kurita at 0330 and then to FUSO herself at 0352; and [F] finally, the evidence in turn indicating FUSO to be the southern BB that blew up. Evidence that FUSO was in fact the BB that was torpedoed and crippled at 0309 and subsequently blew into two halves at 0345 includes: [A] The direct testimony of the MOGAMI, in the best position to observe from directly astern, and her subsequent identification of YAMASHIRO; [B] The BB hit at 0309 was shadowed by PTs as turning south and blowing up at 0345--never entering the major caliber gunfire phase, whereas Lt. Izaki's testimony clearly affirms that YAMASHIRO did so engage; [C] The failure of FUSO to respond to Nishimura's calls; [D] The sections of the exploded BB sank in a position quite close to that of the ASAGUMO, who both reported the wreck of the FUSO and one or more FUSO survivors later became intermingled with those of the ASAGUMO; [E] The testimony of Lt. Ezaki does not coincide well with the circumstances of the first BB hit, but applies very well to YAMASHIRO; [F] MOGAMI again identified the exploded ship as FUSO on her southward retirement; and finally, as above, [G] all the evidence indicating that the YAMASHIRO was not the exploded BB. The damage suffered by the YAMASHIRO, albeit sketchy, is consistent and paints a clear picture of her last hours that needs little examination. Regarding the FUSO's damage, even after having presented all the above evidence, final clarity eludes us. Yet, however difficult it is necessary to attempt to reach a conclusion to form a hypothesis for future investigation. The best one can do at this point is to make an educated guess, one that takes into account all the available evidence and `run with it'. What follows is necessarily conjecture, and is subject to revision should either marine archaeology or a survivor's account introduce new data, but is this historian's honest opinion nonetheless. Critical correspondence regarding it is both welcome and encouraged. With that in mind, we proceed. Possibly what happened went something like this: at 0309 the FUSO was torpedoed in the starboard side amidships. The hits started a moderate but stubborn fire and flooded enough machinery spaces to cause the battleship to list to starboard and cut her speed in half. FUSO pressed on, but as the minutes ticked by, commanding officer Ban Masami learned that matters were getting out of hand. Either fire or flooding, or both, was increasing. Ban turned south, but at 0338 the fire started touching off the 5.5-inch magazines, and within minutes a `sympathetic' detonation of `C' turret magazine occurred. At 0345 the FUSO blew in half, breaking in half just abaft the pagoda, near frame 150. The bow section reared up and bent around as she moved forward. In minutes the resulting stresses toppled parts of the pagoda section as well, which sank. The remainder of the bow, possibly including the conning tower, wrenched loose and remained afloat. For a very short time, the stern section had enough steam to make for land, but soon went dead in the water. With the top-heavy center sunk, the remaining sections retained enough buoyancy to remain afloat. (Alternatively FUSO broke at `D' turret, and the foresection retained the pagoda). Both halves then drifted south, burning furiously; the bow was sunk by gunfire and the stern foundered an hour later as described above. Maybe a few hundred of the crew survived initially, but virtually all were either killed by natives or perished in the water after being denied or themselves refusing rescue. In retrospect, when it is recalled that Nishimura's scout planes had given him a complete picture of the odds he faced, his continued advance was as brave as it was futile. No doubt, he had decided to draw attention away from the suffering Kurita with a stoic advance in the same spirit that Admiral Ozawa's carriers were operating. He certainly succeeded in tying Oldendorf down south, and cannot be blamed for Kurita's celebrated failure to press home the Battle of Samar. It has been remarked that the Battle of Surigao Strait took place on an anniversary of the Battle of Balaclava, the famous "Charge of the Light Brigade" against the overwhelming odds of Russian batteries in the Crimean War. Nishimura's charge for Leyte was scarcely less bold, and the same can be said for the Japanese effort as its Crimean predecessor: "it was magnificent, but it's not war". Today, the great hulks of the YAMASHIRO and FUSO still lie at the bottom of Surigao Strait, the secret details of their final damages locked within them. It is to be hoped that in the near future the wrecks of Surigao will be investigated and some of these questions answered. Ideally, the true sinking positions of the FUSO's remains published here may help spur and assist such investigation. Discovering more details of their last hours is a small, but important way to honor the fallen from both battleships. Perhaps in time, a memorial to the nearly 4,000 that perished in this great nautical "Charge of the Light Brigade" will be built. Special thanks are due to Terrance Manton for original photomontage art of FUSO; and to Jon Parshall for the creation of new detailed maps for this article. Thanks also to Brooks Rowlett, Nathan Okun, Clay Ramsey and Alex Jankovic for providing important review and commentary on several technical and reconstructive details.